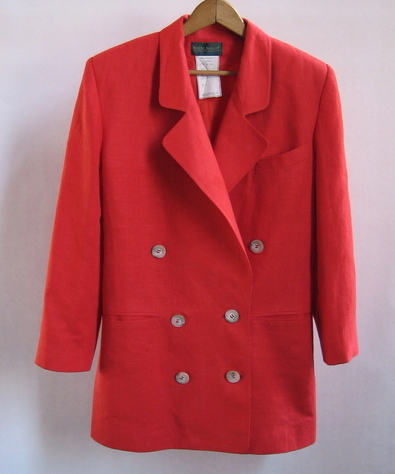 Classic double-breasted blazer with relaxed silhouette in tomato red from Harve Benard, a label known for quality life-style fashions. Slightly nubby fabric finish. Fully lined. 6 horn-style buttons outside, one clear button inside. Handkerchief pocket and 2 slit front pockets. Slight flare at back. Works well with tailored career clothing and casual sportswear. Sleeve (shoulder to wrist): 22.5"
Shoulder seam to hem: 30"
Collar seam to sleeve: 5.125"